Decreased thyroid production can lead to brittle nails. Women who are over 50 have the highest risk of developing thyroid problems. Hypothyroidism may not cause noticeable symptoms in its early stages, or symptoms might be subtle or easily blamed on another factor, the Mayo Clinic advises. If the condition is not identified and treated, however, it can cause more serious problems beyond weak and brittle nails, such as joint pain, obesity, heart disease and infertility. Thin and brittle nails are one of the earliest signs of hypothyroidism. The nails will be slow-growing, soft and have pale nail beds, according to "The Women's Guide to Thyroid Health," by Kathryn R. Simpson. A person also may have ridges in her nails, and the white, crescent-shaped area at the base of the nails can get lighter or even disappear. People who suffer from hypothyroidism also are at risk for fungal infections in the nails as well as ingrown nails. The nail bed also may split from the nail plate, according to "The Perimenopause and Menopause Workbook," by Kathryn R. Simpson and Dale E. Bredesen. Such problems are just one sign of hypothyroidism. Other early warning signs that may come along with thin, brittle nails include constipation, increased sensitivity to heat or cold, fatigue, heavy menstrual periods, weight gain, weakness and pale or dry skin, the National Institutes of Health advises. The reduced blood circulation that comes along with impaired thyroid function is one contributor to thin and brittle nails. Inadequate protein synthesis in the body also can influence nail growth. Poor protein synthesis due to hypothyroidism is the result of the general slowing of a person's metabolism, according to Simpson. Medication is used to treat hypothyroidism. In the majority of cases, thyroid levels normalize with such treatment, and nails begin to grow normally again. The medications, however, will be needed for the rest of a person's life, the NIH advises. Using a skin-softening cream after bathing, clear nail polish that has protein in it and the vitamin biotin also will strengthen nails, according to the NIH. Other issues besides hypothyroidism can cause brittle nails. Brittle nails can also occur with normal aging, according to the NIH. Too much exposure to nail polish also can make nails brittle. A vitamin deficiency can affect nails as well. 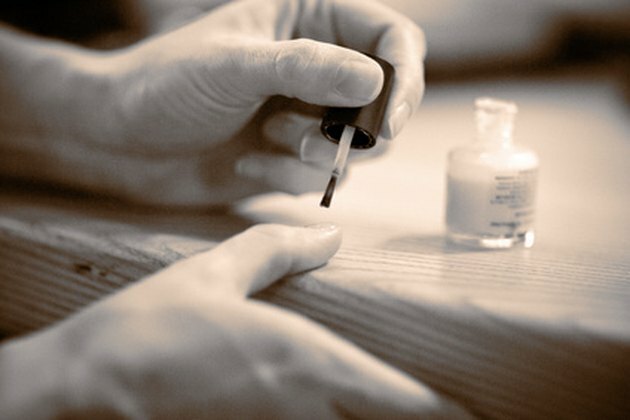 Brittle nails that are not the result of a thyroid problem can be prevented by avoiding nail polish and keeping nails short, the NIH advises.